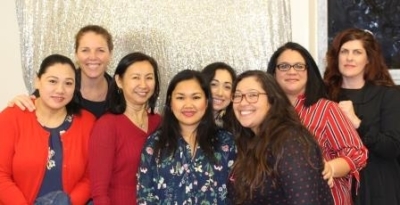 This year, the Parent Teachers Association (PTA) at Carr Elementary School (Carr) in Torrance conducted its first-ever Valentine’s Day Community Dance. The PTA was able to give a little more love to students and their families with a little help from the Torrance Refining Company (TORC). What a fun night it was! On February 8, students decked out in colorful outfits, accompanied by their parents, siblings, and grandparents, arrived at the school hall, which the students had proudly decorated. PTA members offered refreshments to excited attendees who could barely wait to show off their well-practiced dance moves. Before officially turning the space into a dance hall, Principal Katie Schenkelberg welcomed and thanked event sponsors and the hardworking PTA members who planned the event. Carr continued to share some love as PTA President Paula Woods recognized recipients of the Honorary Service Awards (HSA) to loud cheers from students and parents whose lives have clearly been touched by the honorees’ contributions. Awards are given to individuals who have served the Carr community in significant ways. Principal Schkenkelberg was excited to have students, their families, and the North Torrance community benefit from the free, fun way to celebrate Valentine’s Day together. After much applause for the honorees, the party lights turned on, the DJ spun his tunes and the Carr Cubs danced the night way.